These rays have a very wide diamond-shaped pectoral disc that can reach over 9 feet wide, and is a dramatic dark color scattered with light spots or rings. It can grow to over 8 feet long, and when including the incredibly long whip-like tail, it has been measured at over 16 feet long. They prefer bays and reefs, but will school in large groups to cross distance in open water, ‘flying’ through the water and sometimes leaping completely into the air to escape pursuit. It is not considered a good food fish, and when caught, makes loud sounds and should be treated with extreme caution because of its venomous tail spines. 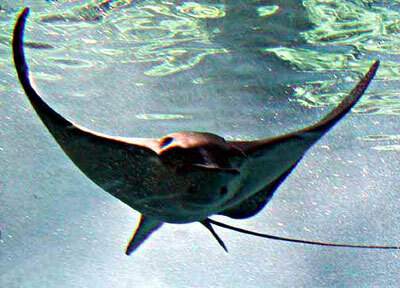 English language common names include spotted eagle ray, bishop ray, bonnet skate, duckbill ray, eagle ray, lady ray, leopard ray, mottled eagle ray, skate, spotted bonnetray, spotted duckbill ray, spotted stingray, spotted eagleray, spotted whipray, sunfish, whip, whip ray, and white-spotted eagle ray. Other common names include aigle de mer (French), arendskoprog (Dutch), arraia-morcego (Portuguese), arraia-pintada (Portuguese), bagtau (Bikol), banagun (Bikol), banagon (Bikol), bolad (Marathi), bulik (Cebuano), chili (oriya), chucho (Spanish), chucho pintado (Spanish), chuchu agila (Papiamento), curooway-tiriki (Tamil), dalimanok (Tagalog), eel-tenkee (Telugu), faaiy (Carolinian), fai manu (Tahitian), fai sikota (Tongan), fai-manu (Samoan), gavilan pintado (Spanish), gefleckter adlerrochen (German), gevlekte adelaarsrog (Dutch), gharabi (Arabic), Imil (Marshallese), jimojo (Marshallese), kakkathirandi (Malayam), kipungu (Swahili), kurivi thirukai (Tamil), lamburu jangang (Makassarese), leik-kyauh-sun (Burmese), leopardrocka (Swedish), madara-tobi-ei (Japanese), madi (Mahl), maylan (Somali), narinari (Portuguese), nek yorany (Kumak), obispo (Spanish), orlen centkowany (Polish), pagi (Tagalog), paging paul (Tagalog), papagaio (Portuguese), pari burung (Malay), pari lang (Malay), pe manuk ((Javanese), pintada (Portuguese), pungo piju ((Swahili), raia-chita (Portuguese), raia-leopardo (Portuguese), raie chauve-souris (French), raie noire (French), ramak-e-khaldar (Farsi), ratau ponteado (Portuguese), raya (Spanish), raya aguila (Spanish), rayo pico de pato (Spanish), spikkel-arendrog (Afrikaans), taachui (Swahili), tagabobon (Banton), taligmanok (Bikol), tiss (Arabic), tubaq (Arabic), vai tonotono (Fijian), vali lovo (Gela), vaval (Malayalam), wakawa (Spanish), and walbuulbul (Spanish). The spotted eagle ray is considered of minor commercial fisheries importance. Presently, fishing grounds are primarily found within inshore surface waters throughout this species range. Methods of capture include trawls, trammelnets, and longlines. It is also fished as a gamefish and provides a good fight when captured on a line. This ray is rarely eaten due to the poor quality of the flesh. Instead, it is used for fishmeal and oil. The spotted eagle ray is a popular display aquarium specimen and is often seen in public aquaria facilities. Generally a shy species, spotted eagle rays are wary of divers and are difficult to approach. However, it is considered potentially dangerous to humans due to the venomous tail spines that can inflict serious wounds. > Check the status of the spotted eagle ray at the IUCN. The spotted eagle ray is distributed worldwide in tropical and warm temperate waters. In the western Atlantic Ocean, it is found in waters off North Carolina and Florida (U.S.), Gulf of Mexico, Caribbean and Bermuda south to Brazil. This ray can be found from Mauritania to Angola in the eastern Atlantic Ocean. 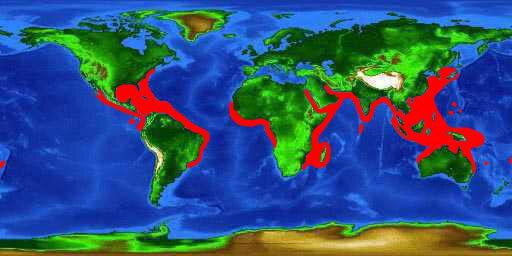 In the Indo-West Pacific, it occurs in the Red Sea and from South Africa to Hawaii, including north to Japan and south to Australia. The spotted eagle ray also resides in the waters of the eastern Pacific Ocean from the Gulf of California south to Puerto Pizarro, Peru, including the Galapagos Islands (Ecuador). The spotted eagle ray is commonly observed in bays and over coral reefs as well as the occasional foray into estuarine habitats. Although it occurs in inshore waters to depths of approximately 200 feet (60 m), the spotted eagle ray spends most of its time swimming in schools in open water. In open waters, spotted eagle rays often form large schools and swim close to the surface. It is known to swim long distances across open waters as evidenced by its presence in Bermuda. This species is capable of leaping completely out of the water when pursued. It swims by “flying” gracefully through the water via the undulation of the pectoral fins. When this ray is caught and taken out of the water, it produces loud sounds. Although much research is still needed on the life history of the spotted eagle ray, it is known that this species shows high site fidelity (individuals often stay in or return to the same location). This ray also interacts socially with other individuals within its own species. 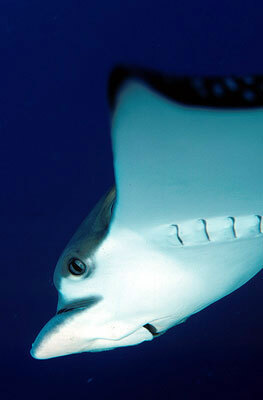 The spotted eagle ray has a very angular disc and a long, broad snout with a v-shaped internasal flap. The ventrally located mouth is well- adapted for feeding on benthic prey. 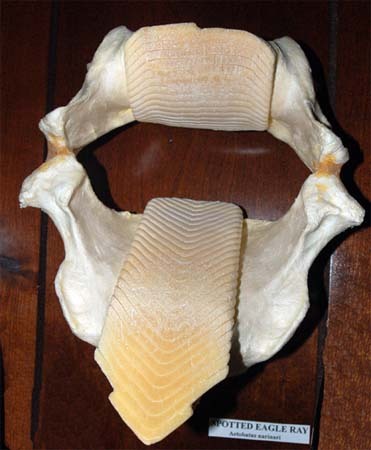 The flattened body disc is broad and short, measuring about twice as wide as long. Large spiracles originate close to the pectoral fin origins. The fleshy subrostral lobe is duckbill-shaped and distinct from the upper snout. The wing-like pectoral fins are broad with pointed tips. The trailing edge of the pectoral fins is deeply concave with angular tips. The pelvic fins are narrowly rounded and the dorsal fin is small with its origin just posterior to the pelvic fin insertion point. There is no caudal fin on the spotted eagle ray. The tail is very long and whip-like, reaching lengths of 2.5-3x the width of the disc when undamaged. The stinging spines, originating just behind the dorsal fin, are short and number from 2-6. They have a barbed tip and recurved lateral teeth along with a forked root. These venomous spines can deliver a nasty sting when used in defense against potential threats. 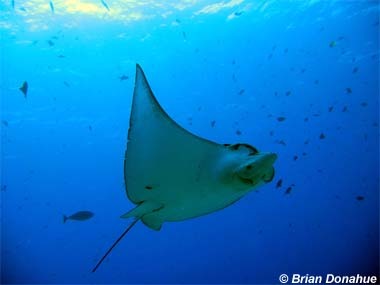 Similar species sharing distribution ranges with the spotted eagle ray include the southern eagle ray (Myliobatis goodei) and the bullnose ray (M. freminvillii). The southern eagle ray has a dorsal fin originating well behind the level of the rear edges of the pelvic fins while this fin originates just behind the pelvic fin insertion point in the spotted eagle ray. In contrast, the bullnose ray has a dorsal fin origin close to the level of the rear margins of the pelvic fins. Also the bullnose ray is absent from the Gulf of Mexico and the majority of the Caribbean Sea. The coloration of both of the southern eagle ray and the bullnose ray ranges from a uniform gray to reddish-brown with diffuse white spots on the dorsal surface. 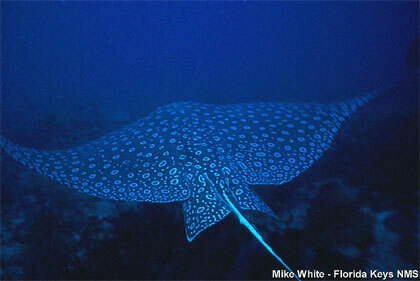 Another species that closely resembles the spotted eagle ray is the longheaded eagle ray (Aetobatus flagellum). However the uniform coloration of the dorsal side of the longheaded eagle easily distinguishes it from spotted eagle ray which has a spot pattern on the topside of its body. As one of the most beautiful rays, the spotted eagle ray has a dramatic spotted pattern across the dorsal side of the body. The small white, bluish-white, greenish, pearly, or yellow spots are distinct against the black, dark gray, or brown body color. A variation on this pattern includes larger white rings each with a black center, and these rings sometimes join to form lines and circles. The ventral surface is white in color, making it easy to see them underwater as they flap their pectoral fins during swimming. The disc and fin outer margins as well as the tail are darkly shaded or black. The tail has a white base and in freshly caught specimens, there may be crossbars on the tail. The upper sides of the pelvic fins are a similar color to the background color of the body along with dark posterior edges and 6-10 spots. The dorsal fin is either uniformly dark or has a blotch on the front edge. The smooth skin surface of the spotted eagle ray lacks denticles and thorns. The tail spines are not smooth, but instead have lateral teeth and a barbed tip. There is a single row of broad, flat teeth in each jaw that combine to form a single plate. The upper tooth plate takes up about 80% of the width of the mouth while the lower plate takes up approximately 60%. Three to six of the anterior teeth of the lower jaw project beyond the upper tooth plate when the mouth is closed. These plate-like teeth are used to crush shellfish including clams, oysters, and whelks. The roof of the mouth contains a row of 6 or 7 short papillae close to the upper dental plate while the floor has about 6 papillae. The papillae remove shells from prey items prior to ingestion. The spotted eagle ray reaches a maximum length of 8.2 feet (2.5 m) not including the tail, with the total length including an unbroken tail reaching close to 16.4 feet (5 m). The maximum disc width is 9.8 feet (3 m) and maximum published weight is 507 pounds (230 kg). Clams, oysters, shrimp, octopus, squid and sea urchins as well as bony fishes provide prey for the spotted eagle ray. This ray is well adapted with its shovel-shaped snout and duck-like bill for searching in the mud for benthic invertebrates. When a prey item is found, the ray crushes it with its plate-like teeth and uses the papillae located in the mouth to separate the shells from the flesh. Upon scientific observation, the stomach contents of spotted eagle rays contained intact prey items lacking any remnants of shells. Mating behavior often includes the pursuit of a female by one or more males. These males grab her dorsum with their upper tooth plate. One male then grasps the edge of the female’s pectoral fin and rolls to her ventral side. The male then inserts a clasper into the female ray. The actual mating lasts 30-90 seconds while the pair are positioned venter-to-venter. Females have been observed to mate in this manner with up to four males over a short time period. Sharks, including the silvertip shark (Carcharhinus albimarginatus) and great hammerhead (Sphyrna mokarran), are predators of the spotted eagle ray. 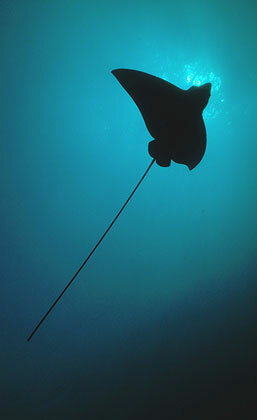 Sharks have also been reported to follow spotted eagle rays during the birthing season, feeding on newborn pups. Trematodes, including Thaumatocotyle pseudodasybatis, commonly infect the skin of the spotted eagle ray.Clemacotyle australis was reported in the branchial cavity of an individual caught in Australian waters andDecacotyle octona n. comb was found on the gills on another individual. Acanthobothrium monski n. sp. and A. nicoyaense n. sp., both tapeworms, also parasitize the spotted eagle ray. In addition, a marine leech, Branchellion torpedinis, has been recorded on the pelvic fins of a specimen from Venezuelan waters. The spotted eagle ray was originally described in 1790 as Raja narinari (Euphrasen 1790). The name was changed to Stoasodon narinari and later to the currently valid name Aetobatus narinari (Euphrasen, 1790). The genus name Aetobatus is derived from the Greek aetos meaning “eagle” and batis meaning “ray”. Synonyms referring to this species in past scientific literature include Raia quinqueaculeata Quoy and Gaimard 1824, Myliobatis eeltenkee Rüppell, 1837, Myliobatis macroptera McClelland 1841, and Aetobatis latirostris Duméril, 1861. A. narinari, sometimes considered a species complex rather than a single species, is currently under review.